When startup Alphyn Industries speaks of jacketing an Apple iPad, the company means it in a literal sense -- this PADX-1 Ledge is a form-fitting polyester and silicone pullover with a zippered shelf to both protect your slate and offer easy access. Twin straps hold up the slate in a work-friendly position, connected to load-bearing straps built into the jacket that fully distribute the weight -- a technique founder Ben Raviv learned as a ballistics specialist for defense equipment provider HighCom Security. 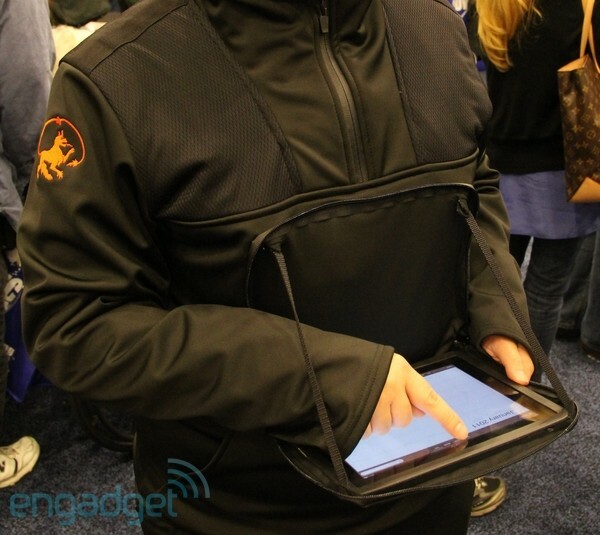 At $285, it's certainly an investment, but we found the garb both comfortable and quite warm when we donned it today at Macworld 2011, and though the close proximity of the screen to our chest didn't make for easy typing, it's more useful than other products we could name.